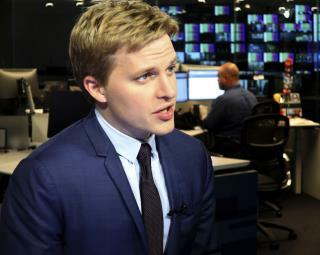 (Newser) – Hours after Jeff Bezos accused the National Enquirer's parent company of blackmail, Ronan Farrow said American Media Inc. had done the same thing to him and at least one other journalist. Farrow tweeted Thursday night that after breaking stories on the Enquirer's "catch and kill" arrangement with President Trump, the journalists "fielded similar 'stop digging or we'll ruin you' blackmail efforts from AMI." Farrow reported on the arrangement for the New Yorker last year, Mediaite reports. In his tweet, he said he didn't engage with the blackmail attempt because he doesn't "cut deals with subjects of ongoing reporting." I am surprised the Enquirer does not sue Trump for using "fake news" as much as he does, since they are the king of it. Trump has such a fine circle of friends.... Bannon, Manafort, Stone, Pecker, etc. Now Pecker is still trying his same old blackmail tricks to stifle journalists and newspapers.... and it is backfiring. Bezos said.." You wanna play? Okay... bring it!". Now AMI has no comment.